Tea Leaf Reading for Beginners: Your Fortune in a Tea Cup - PaganSquare - Join the conversation! In chapters one and two, Dow gets us started on how to choose our tools correctly, teacups and saucers being the most obvious necessity, along with other optional accessories: napkins and spoons. The type of tea is also important, and Dow holds nothing back when discussing brew options; it’s a lot of information, it’s never overwhelming. Dow encourages her readers to flip through if blends are not your interest, though her writing style is engaging and humourous, so there’s really no reason to skip. The chapters end with how to properly brew a cup of tea (not too many leaves! ), followed by a preliminary examination of your cup and methods on how to invert the cup. Chapter three is devoted to interpreting the leaves, facilitated by Dow’s clearly-outlined steps. This is followed by how to time events, how to tell the story within the cup and divination ethics (when reading for others); after all, not every piece of information can be good! In the fourth chapter, Dow gives us some sample readings, complete with pictures of the teacup from all angles. Though the pictures are very helpful, larger images would be better, as the pictures are of poor quality and they are fairly small, making some of the shapes in the cups hard to discern. Dow expands on the previous tea blend section by devoting chapter five to herbal infusions and decoctions. She shows us the benefits of tisanes, oﬀers precautions, preparations and how to properly harvest your own herbs. This is followed by a “must have” list of ten herbs to keep in stock and suggestions on how to treat minor maladies with your herbal blends. With tea drinking and brewing comes proper tea etiquette, tea parties and tea houses, which are what you’ll find in chapter six. Dow takes this on with a lightheartedness that otherwise might not be expected when discussing the how-tos of these subjects. In the final chapter of Part I, Dow delves into the superstitions, magic and other uses of tea, such as with cooking and, surprisingly, uses in household chores. Part II starts with the symbology of positive and negative signs and special symbols, after which she includes a comprehensive symbol dictionary divided into categories from animals, geometric shapes, numbers and letters to Zodiac symbols. The book is rounded off nicely with two appendices on tea history and health benefits. Finally, the last pages are devoted to a nice, clear glossary for your quick-search needs. Overall, Tea Leaf Reading for Beginners was a highly entertaining and witty read and will certainly change how one looks at their humble morning cuppa! 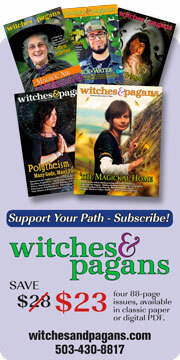 This article first appeared in Witches&Pagans #24. Devoted to Pagans, Witches and Earth based magical practitioners, this magazine is available in both print and digital editions. Download the full PDF edition.